for all convex polyhedra. The idea that this specific alternating sum should remain constant no matter what convex polyhedron you feed it is not at all clear. We will try to prove it by induction, the obvious question being induction on what? To answer that we first make a cute observation. We can transfer these data relating to our polyhedron into some data about a connected graph in a simple way. 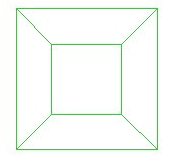 To see how lets look at the example of a cube. for any connected plane graph. We do so by induction. and in both these one can verify the desired formula, in case we have and in case we have . With three edges there are multiple possible graphs, but we don’t need to worry about that. Let’s prove the inductive step: suppose that the formula holds in when there are edges. Now suppose we have a graph with edges, vertices and faces. If has , delete an edge from a face to obtain a new graph with . Now by our inductive hypothesis we have that, since has n edges, it satisfies the desired formula, hence , and this is exactly what we needed to show. If doesn’t have then it must have an end vertex (a vertex joined only by one edge). Then has vertices and edges. If we delete an end vertex and its edge then we obtain a new graph with vertices and n edges. Hence by the inductive hypothesis , which is again just what we wanted to show. And this complets the proof of Euler’s formula. Theorem: These are the only regular polyhedra. From this equation we can deduce that the only possibilities for the pair are and . It is geometrically clear that these 5 pairs lead to the 5 Platonic solids listed above, and to no others! Given a Platonic solid, putting a vertex at the midpoint of each face gives the vertices of the dual polyhedron. It should not be too much of a leap to believe that this dual is itself a Platonic solid. Well, we have just classified the Platonic solids, and there are only five of them, so taking the dual of one doesn’t give a ‘new’ shape, rather it will give one of the five we already have. Given the data (V,E,F, p, q) of a Platonic solid, say P, what can we say about the associated data of its dual, P’? Well, each face in P gives a vertex in P’, by definition of the dual construction. Again, it is geometrically clear that each vertex corresponds to a face in the dual, so we get , we get that the number of edges remains the same, and that . This implies that (P’)’=P. Indeed looking at the table above we get the following dual pairs: cube octahedron, dodecahedron icosahedron, tetrahedron tetrahedron. It can be fun to picture a dual P’ sitting inside the original shape P, and then sitting its dual P”=P sitting inside P’, and so on, getting smaller and smaller indefinitely! Having this image in mind one see that dual shapes share the same symmetry groups.